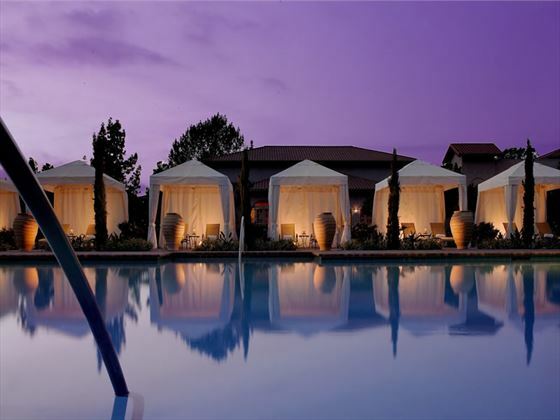 Situated on a world-class golf course, this luxury resort and spa is only minutes from all the attractions of San Diego. The hotel provides elegant accommodations and all of today’s modern conveniences. Rancho Bernardo Inn is surrounded by a 18-hole golf course. The hotel is also only a short distance away from the downtown area. Guests can easily discover many attractions, including SeaWorld, the San Diego Zoo and pristine beaches. Guests at the Rancho Bernardo can relax after a long day with a massage from the hotel’s spa, go for a refreshing swim in the spacious swimming pool or re-energize in the state-of-the-art fitness centre. Upgraded Linens and Custom Furniture throughout. Warm and inviting colors and artwork to complement the Resort’s Southern California/Spanish style. Deep Soaking Tubs and Luxury Bath amenities from Aveda. Large Workspace, Desk and Wireless Internet. Large 42” Flat Screen TVs perfect for viewing movies or your favorite Sporting event. Guest Suites at Rancho Bernardo Inn Golf Resort & Spa are luxurios, spacious and inviting. Each Guest Suite features a separate, full-size living room, expansive Private Patios or Balconies which are a great place to escape to after a long day of Meetings or Golf – relax with a cool drink and enjoy the views of the Championship Golf Course or the manicured gardens. Veranda - Casual dining experience with its French country charm and Brasserie menu, whilst enjoying picturesque views of Rancho Bernardo Inn’s Golf Course. The Spa – Enjoy World-Class Spa Treatment in one of our Temperature-Controlled, Outdoor Spa Cabana’s and relax with the soothing sounds from cascading Water feature. Relax at the new Aragon Pool and Hydro-Spa or in one of the 7 Technology Equipped Cabanas – perfect for Lounging or Dining.